The South West's brewing industry is hoping that the Chancellor will leave them alone when he steps up to the dispatch box tomorrow to make his annual budget statement. Twelve months ago George Osbourne scrapped the beer duty escalator which saw the price of a pint rise year on year. Some of Britain's biggest brewers have written to him to urge the status quo to be maintained as the sector is seeing a revival. The trade is worth around £22 billion pounds a year to the treasury in taxes and with the number of small independent breweries increasing then it's clear to see why the Chancellor is being asked to resist any rate rise. 33 million more pints were drunk in 2013 than in 2012 with small independent breweries seeing growth of 8% according to the annual Beer Report 2014 published by SIBA, the Society of Independent Brewers. Joe McCaig owns The Holt in Honiton. He's seen beer sales rise in the past year. 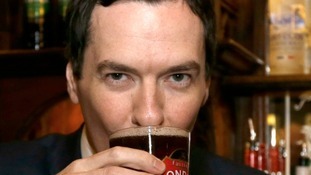 He's urging the Chancellor to freeze duty on beer tomorrow.